Flash cartoon animation is a mix of illustration, design, storytelling, sounds, interactivity, creativity and timing. When we mix all those ingredients, we create a compelling message for your viewers. We start a new project with a storyboard. A storyboard is a series of illustrated captions based on the scenario that break your cartoon into sequences. We plot with this storyboard all elements that you've asked us to include in your cartoon while paying attention to the timing. The storyboard is also your brainstorming tool. Once you approve the entire storyboard, we are ready to start the production. We work on character, props and background designs just like we do with the storyboard. That's usually the fun part for our clients as they get to see their project come to life. We create turnarounds of the designs, so your characters and props look the same, whether we look at them from the back view, their left side or even from a bird's eye view. Next is the recording. We test the recordings and the music to determine the real length of your project. It's easier to base the timing to dialogues and music, rather than match sounds to an existing animation. It also costs less money to start with sounds because we reduce the amount of trials. This way, your characters will always lip sync correctly. Often, when clients request it, we create an animatic. An animatic takes the illustrations from the storyboard and matches them with the recorded sound in a rough video. It helps you get a concrete feel for your cartoons. After getting the definitive timing of your project, we animate each sequence. As we already broke your story into sequences during the storyboarding stage, it's also easier for you to approve and ask for adjustments. Because we animate our Flash cartoons with pencils and paper, we create pencil tests. Pencil tests are rough animated tests where you can see the movement of your animations. Once you approved the pencil test, we use the approved drawing to create the clean version of your animation. Once it is drawn, we'll scan all drawings, and integrate them within Flash, where we will colour them and add special effects and camera movements. Then, we'll match the animation with the sounds that were created earlier. If there are interactions to program, we will add them to the cartoons. The final stage is exciting, as it's where everything comes together. 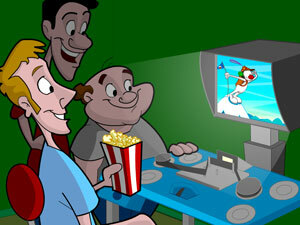 If your project is for the Web, we'll publish a movie of your cartoon from Flash. We'll test it to make sure the file size remains as small as possible. If your project is for television or film, we'll output your animation for an editing program. From there, it can even be formatted for a DVD release. If your project is for a game or another interactive format, we'll publish the sounds and images into sequences, so they can be reassembled in a game authoring environment. That's all there is to Flash cartoon animation. Don't hesitate to ask us more question or give a project quote. Always remember to be as detailed as possible as each project is different and a small parameter can change the budget and time it takes to finish an animation. Submitting a project request through our Project Quote Form helps us understand your needs better. Here are a few things to remember though. Telling us that your animation is about two minutes long is not enough information for us to provide a price. We need to know more about your project, such as how many characters, backgrounds, are the voices prerecorded or not. How complex are the characters' designs? Flash cartoon animation is labour intensive. We sketch every drawing, scan, colour, and fine tune them. We can't provide free samples, create grandiose cartoons with $500 budgets, or get paid "when the project sells."